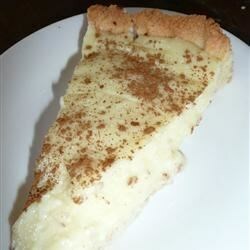 "My 'ouma' South African grandmother's legendary milk tart. It is lip-smacking. The recipe is a real winner. It is a traditional South African tart that is very easy to prepare." Preheat the oven to 375 degrees F (190 degrees C). Coat a 9 inch deep dish pie plate with vegetable oil cooking spray. In a large bowl, mix together the butter and sugar until smooth. Add the egg yolks and beat until light and fluffy. Sift in the cake flour, baking powder and salt, and stir until well blended. Mix in the vanilla and milk. In a separate bowl, whip the egg whites to stiff peaks using an electric mixer. Fold into the batter. Pour into the prepared pie plate, and sprinkle cinnamon sugar over the top. Bake for 25 minutes in the preheated oven, then reduce the temperature to 325 degrees F (165 degrees C). Continue to bake for 25 to 30 minutes, or until the center is set when you gently jiggle the pie. Serve hot or cold. I prepared this for an International Dinner held by my church. It was a sensation! Wonderful. I received rave reviews when I made this for a few friends. Very good. I made this as a dessert accompaniment to the Moroccan Tagine recipe on this site, and it was a nice balance to the spiciness of the Tagine.